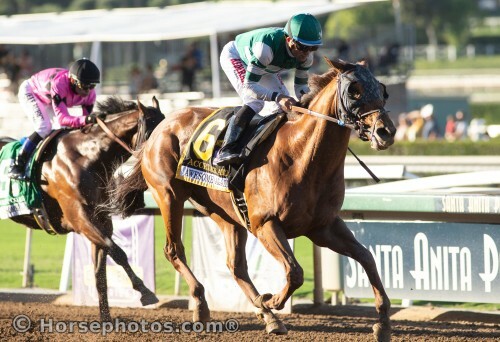 Accelerate, earning a fourth Grade 1 victory this year in Saturday’s Awesome Again Stakes at Santa Anita Park, remained atop the NTRA Top 10 Thoroughbred Poll for the seventh consecutive week. Voters awarded the five-year-old son of Lookin At Lucky with 13 first place votes and 379 points compared to eight first place votes and 360 points in last week’s poll. The Hronis Racing color bearer is expected to start next in the November 3 Breeders’ Cup Classic at Churchill Downs. Two horses made significant upward moves in this week’s Top 10. Versatile five-year-old runner Mind Your Biscuits vaulted from tenth to fourth off a win Saturday in the Lukas Classic at Churchill Downs and five-year-old sprinter Imperial Hint advanced from twelfth to eighth after an easy win in the Vosburgh at Belmont Park the same day. Imperial Hint is likely to run next in the Breeders’ Cup Sprint, whereas the connections of Mind Your Biscuits are considering one of three Breeders’ Cup races as a next start. Two horses in last week’s NTRA Top 10 made notable downward moves this week. Diversify dropped from third to tenth position after finishing off the board in the Jockey Club Gold Cup at Belmont Park and Abel Tasman, last year’s Eclipse Award-winning Champion 3-Year-Old-Filly, fell from fourth to twelfth after running fifth in Sunday’s Zenyatta Stakes at Santa Anita Park. The NTRA Top Thoroughbred Poll is the sport’s most comprehensive survey of experts. Every week eligible journalists and broadcasters cast votes for their top 10 horses, with points awarded on a 10-9-8-7-6-5-4-3-2-1 basis. All horses that have raced in the U.S., are in training in the U.S., or are known to be pointing to a major event in the U.S. are eligible for the NTRA Top Thoroughbred Poll, which continues until November 5, after the Breeders’ Cup World Championships.